Celebrate the iconic couple and their timeless romance! Designed by Jim Shore, the duo sits atop a heart, holding hands and staring into each other's eyes affectionately. 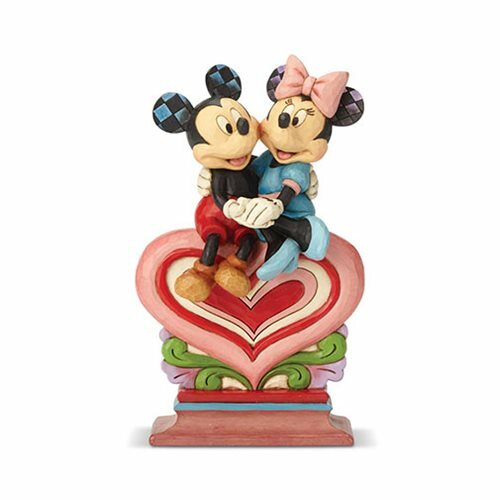 Cherish their enduring love with this heartfelt Disney Traditions Mickey Mouse and Minnie Mouse Sitting on Heart Heart to Heart Statue by Jim Shore! This stone resin statue makes a great gift for any Disney fan. Measures about 8 1/2-inches tall 5 1/5-inches long x 2 1/10-inches wide.